The Birmingham Energy Institute would like to congratulate Professor of Electrical Power Systems, Xiao-Ping Zhang on his recent appointment as one of the first Foreign Fellows at the Chinese Society for Electrical Engineering (CSEE). The CSEE is a national, academic organisation formed of leading researchers in electrical engineering related fields. Originally formed in 1934, today the CSEE has nine working committees and 43 professional committees equating to 120,000 individual engineers and over 1000 organisations registered as members. In 2019 the CSEE revised its membership structure and established the grade of Foreign Fellow for engineers who have achieved a distinction in electrical engineering and have supported the development of international relationships. Professor Zhang is one of a select group of individuals that has been awarded the honour of becoming part of the CSEE’s first batch of Foreign Fellows. 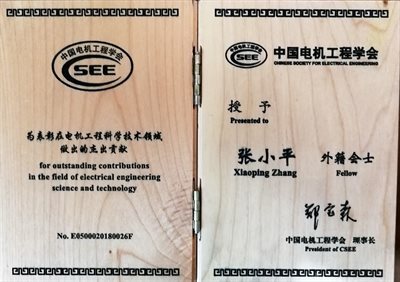 The CSEE hopes that Foreign Fellows like Professor Zhang will continue to support the CSEE in boosting their international academic exchange within the electrical engineering whilst raising the global presence of the society’s work. Other recently announced Foreign Fellows include Professor Vijay Vittal, Fellow of US Academy of Engineering, Professor Saifur Rahman, Fellow of IEEE, President of IEEE Power & Energy Society.